A vaccine breakthrough could potentially save the lives of thousands of foals each year, after researchers successfully protected young horses against a deadly form of pneumonia. The findings suggest a commercially available vaccine against Rhodococcus equi could be within reach. The findings of the research, funded by the Morris Animal Foundation, has been reported in the journal PLOS Pathogens. Texas A&M University researcher Dr Noah Cohen, one of the senior authors of the paper describing the trial, said the vaccine was the result of many decades of effort. He described the vaccine, developed in collaboration with researchers from the Harvard Medical School, as the first effective vaccine to protect foals against infection from R. equi. R. equi is considered the most common and important form of pneumonia in foals older than a few weeks of age. In addition to causing severe, insidiously progressive pneumonia, infection with R. equi can affect other organs in the body, such as bones (including the spine), abdominal lymph nodes, eyes, joints and brain. Fatality rates range from 20 to 40 percent among infected foals. There currently are no licensed vaccines to protect against foal pneumonia, creating a critical need for development of one. For the vaccine trial, Cohen’s team first investigated if vaccinating pregnant mares at three weeks and six weeks prior to the birth of their foals protected their newborns against foal pneumonia. The team found antibodies that ward off pneumonia were transferred to the foals via the mares’ colostrum, which was critical to establish as horses lack the ability to transfer antibodies through the placenta. Most importantly, those antibodies were able to protect almost all the foals born to vaccinated mares from contracting pneumonia. Next, the team conducted a small, randomized, controlled study of nine foals with R. equi. 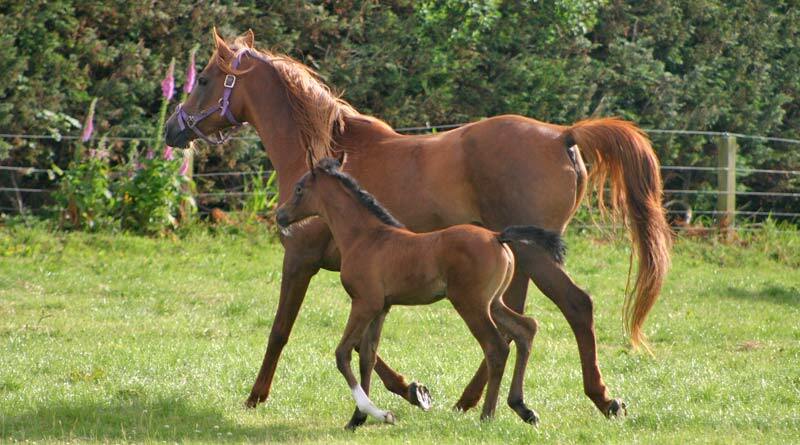 Five foals were given serum with high levels of antibodies against R. equi and four were not. All five foals receiving the hyperimmune serum were protected against R. equi pneumonia whereas the foals that received standard plasma all developed pneumonia. Further safety testing is ongoing, but these early results appear to support the safe and effective use of this novel foal vaccine strategy against pneumonia. Moreover, it suggests that immunizing donor horses with this vaccine could be used to produce plasma with which foals could be transfused to prevent R. equi pneumonia. Pneumonia caused by R. equi, which often clusters by farms, is found on all continents except Antarctica. Some farms experience problems recurrently and other farms sporadically or not at all. Despite effective antibiotic therapies, the incidence of this disease remains high, and many affected foals die. At farms that have problems with this disease, an average of 15 percent to 20 percent of foals develop pneumonia in a given year. In addition to protecting foals against pneumonia caused by R. equi, Dr Cohen said the new vaccine has the potential to protect against other diseases, including sepsis, the leading cause of death for foals in the first few weeks of life. Other potential disease targets for the vaccine include bacterial infections such as Streptococcus equi subspecies equi, the cause of the ancient and prevalent disease known as strangles. “Developing a vaccine to protect foals against pneumonia has long been a priority at Morris Animal Foundation and of the equine researchers we support,” said Dr Kelly Diehl, the foundation’s interim vice-president of scientific programs. An earlier report on the research can be found here.